As the Ottawa weather hasn’t been as helpful as last year when the snow was gone by now, and because our school has plenty of teams vying for the little practice space we have, the head of the Jr team (U16s) I assist asked if I could run a video session today. I have significant experience running video analysis sessions for experienced players, but the challenge with this group was to keep the ‘veterans’ (of two or three years) interested but also not to alienate the kids who are relatively, if not completely, new to rugby. I decided to pick a clip that could reinforce all of the good ball-in-hand, passing, support, and simple defensive lessons we’ve been giving over the past two weeks. In choosing an appropriate video, I avoid the classics – highlights and full games. I don’t like highlights as they tend to show that which is beyond the ability of many amateur players, especially kids. They also don’t often show the build up to the try – just the final act(s). There’s so much more that can be learned from a try by analysing how it unfolded from start to finish. Full game clips will show these, but there’s also a lot of ‘down time’ – such as ball into touch, jogging to set pieces, etc. – that can cause the attention of even die-hard rugby fans to wander. The ‘useless’ bits also run the risk of detracting from the messages you want to convey. Simple guideline for selecting video: find something that’s appropriate for your level and that fully displays the lesson(s) you want the players to learn. Ideally, the clip will be wide-angled to show what most of the players are doing at any given time and from a high (side on to show depth; end on to show width) vantage point. Given the relative ‘newness’ of our players, and the fact that most of the experienced ones don’t watch a lot of rugby, I chose a clip that not only exhibits the aforementioned ideal conditions but which also demonstrates the lessons clearly. If I were training advanced players, I’d probably go for clips with more subtlety that would add to their years of experience with the game. With relatively inexperienced U16s, I wanted the consequences of the actions they see to be fairly obvious to reinforce what they (should) already know or hammer home the message that the game can be successful when simple concepts are applied. For that, I chose a recent clip from YouTube, courtesy of the English RFU, featuring their U18s against Portugal. 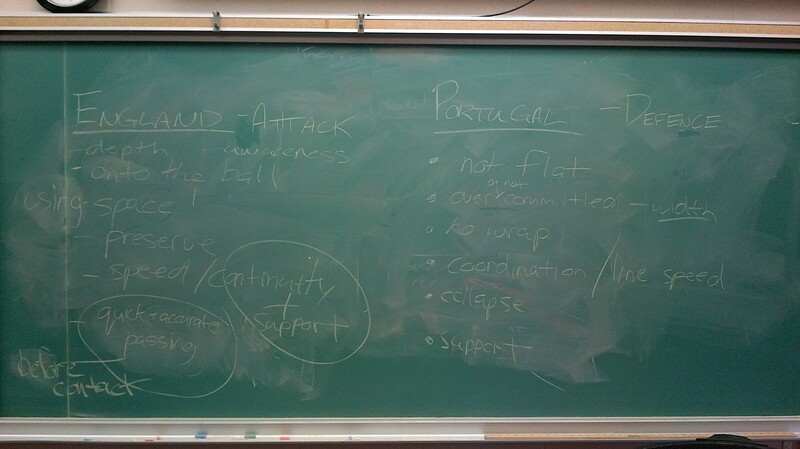 I split the classroom into two halves and said very simply: “One group watch and write down the things England do which allow them to score tries; the other take note of things which cause Portugal to fail.” Simple elements of attack and defence. No help from me. No commentating on the video. Just watch, discuss in pairs or small groups, and take notes. There was lots of chatter as the clip was played and everyone was engaged – even the newbies (some of whom were paired with each other). I was tempted to ensure a vet was with them, but also didn’t want the vet to do all the analysis, so let it go. Upon stopping the video, I took answers from one side at a time, making sure not to give any suggestions, only clarifying and combining where appropriate. I then asked open-ended questions to get them to decide upon what were the most important factors. These are the notes I made with their input. My main purpose was to teach them that successful attack is based on very simple conepts. I congratulated them on some fabulous answers, and was actually impressed by a few from unexpected contributors (like the Mexican boarder who’s never really seen a game before!). I said to them that when I first watched the clip, I only wrote down three common things that led to England’s tries and challenged them to think what they were. This prompted an engaging and intelligent discussion where I turned down several answers which could have been spot on with another coach, and were certainly accurate. I took care not to downplay that input, but suggested that I wanted the three simplest facets. When individuals finally explained their reasons for two of the three, I circled them (quick, accurate passing and support). Someone had mentioned ‘space’ at the start of the discussion – which was close – but prompting and open questions from me couldn’t get the answer I was looking for, so I told them to hold off and we came back to it at the end. Great answers from the previous two weeks’ training sessions about width and depth kept coming up, but I added that we can still be successful with narrow channels and even if playing a bit too flat. Finally, someone said “Just using the space!” and I pointed at him and shouted “That’s it! At your level, the space is always there! Take or find the space!” Defences our boys face aren’t as well organised as pros. We need to take the space or find it with quick and accurate passes, and support those runs. The game is as simple as that! In addition, I stressed that the ball carrier isn’t always the ideal person to spot and make those decisions (esp. with their lack of experience), so encouraged them to call out those opportunities, which allows the ball carrier to make informed decisions. I left out one specific element and had the boys watch the clip again to apply the concepts the group decided were most important. The final piece of the puzzle came from one of the outside backs part way through and I stopped the video, asking him to tell that to the group. (I’d have questioned them about timing soon enough.) He said, “They always pass before or from contact as well!” … which is the other key bit we’ve been teaching them. That the game is best played on your feet, with as many potential attackers in play as possible, so the timing of the pass has to be considered. The problem with the smash-em-up rugby all-too-common in Canada is that for every ruck, you take out four or five of your own attackers to secure and re-start possession. More and more, the teams we face are committing just one or two to the ruck (as we tend to do), leaving more defenders standing than attackers. This prompts slow play to allow those in the previous ruck to catch up – if attacking teams don’t charge blindly into the wall of defenders that is! Played in the spaces, before contact, and with quickness and support, teams can cause disarray among the defenders as England did Portugal. We then continue to teach that through the drills which develop skill and games which apply skills and allow them the chance to spot for / create and exploit spaces. We can tell players this until we’re blue in the face, but to what degree of success? 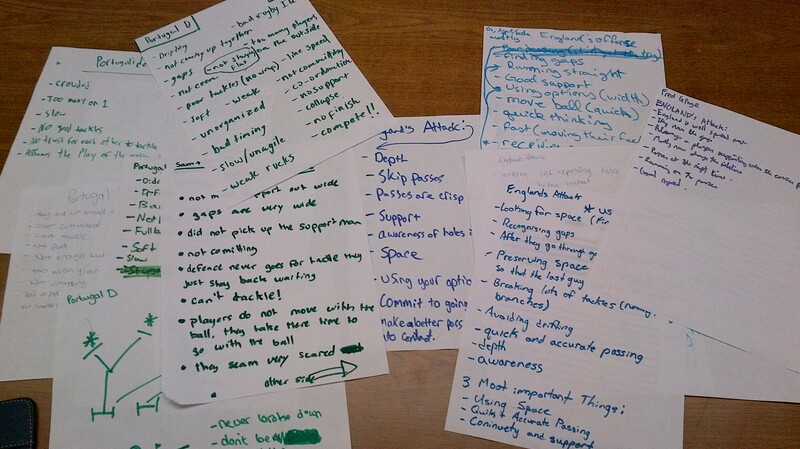 I know not every player contributed to the visual, written, and discussion aspects of this lesson, but the photo of the board above and this collection of notes below let me know that the boys are quite knowledgeable already and are well on their way to being ‘rugby smart’. It also can give me a sense of where we are with our lessons and allow us to re-visit missed concepts or push on to new ones. 2. Show the clip with no sound (one less distraction) and give the athletes clear guidelines on what to watch for. Run it slower than normal, if possible. 4. Have them tell you the answers to your open-ended questions. If they stumble, lead them with more open-ended questions. Resist giving answers at all costs. This allows players to take ownership for their learning. 5. Write their answers on the board for all to see and clarify any confusion. Condense answers into simplistic / standardised terms and concepts. 6. Remind them of the simplified / standardised concepts and show the video again. 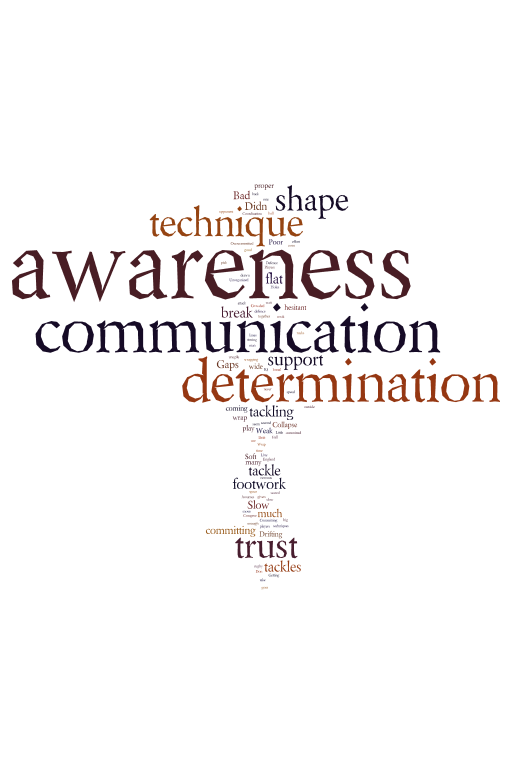 Listen for those ‘aha’ moments as players “get it”! 7. Collect their notes. Condense the answers and have them and the clip available for review on a shared drive / site / device. 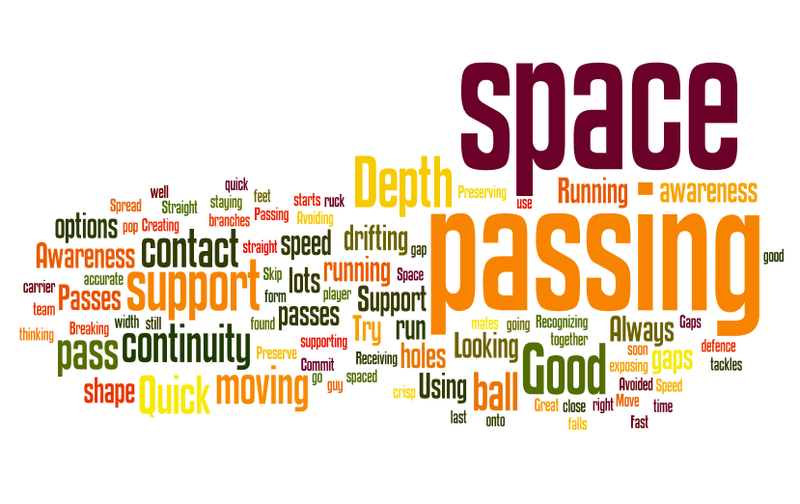 I collected all the sheets, standardised or simplified the language of some, and created a little word cloud using wordle.net. Found the results very interesting!